Hiya. I'm a Go player. I had a pause of few months between last playing more than once a month and the several games a day now. My old KGS account is piipaa and the new one is puripuri. I was something like 1 dan to 2 kyu KGS in the past, now I'm back to 2 kyu solid. I am cute and pokeable and respond to cookies. 25/04/04: How disappointing it is to see, that I haven't played enough Go despite what I set out to accomplish. Something about losing just makes me want not to play at all. Also I'm very disappointed in the quality of the games I've been playing -- The endless mistakes made on both sides are plain horrible, and a reason enough not to spend any time dwelling on the records. I visited KGS 1k and 3k a few times and seem to be settled on 2k for now... Mainly because of the stupidity, with which I manage to throw away won games. Including several losses by time from a winning position, throwing away groups in yose, and all that annoying stuff that happens just too widely in this game (and in life, respectively). Shikkari shinasai yo? Eighty-eight losses to go. I'll have to re-force myself to lose more games played in a serious mood... Only question remaining is, that was there once a time when I enjoyed every game I played? Probably not. I remember my first game of Go, from before I had even read the rules of the game... Also the malice I felt when the score stated I had lost. Also I'm announcing an important declaration here. It simply goes: 4-4 is silly. I think openings with multiple 4-4 corners too often get stuck in the same old shapes that everyone plays over and over again. 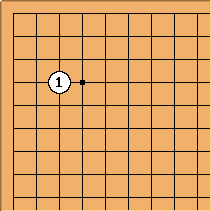 However this 3-4 move is very cool and intriquing, as seen from the diagram. 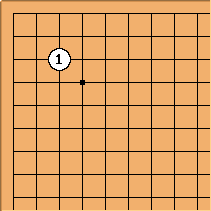 Do you see the beauty of the 3-4 move? Here we see a very cool move. Just because it's more unpopular and unexplored amongst the general public (assumption), it tends to bring chaos and confusion into the game... Thus bringing out a more relevant part of the spirit and genuine creativity of the players dealing with this move. No, I don't think so either. But, it is a very cool move anyways. Writing now (21/04/04), I just suddenly came to realize how little Go I actually play. I watch higher dans play and do teaching now and then, but just normal playing with people of similar ranks has been completely left to the back seat. Also I probably never followed the advice I've given so often to many people: "A beginner should lose 100 games as fast as possible". Well, maybe it was 50 games. Anyways now I'm going to try my hardest, and lose 100 games doing it, all by playing even or near-even games as often as there's time. I already have two losses, only 98 to go.